Yesterday I got a long comment from Andre Viljoen (the owner of Woodstock brewery) and he had some really good news. The southern part of Woodstock, seen from the northern end, with Devil’s Peak in the background. 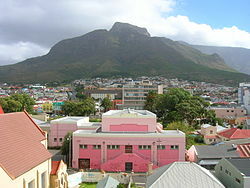 The pink building in the foreground is the town hall. The equipment has been designed by a German Brewmaster according to the brewery needs and has been manufactured by Zhongde. Andre Viljoen: We have requested a very wide range of functionality and they have accommodated our requirements. Recently they joined together with Devil’s Peak Brewing Company and bought the Paulaner restaurant and brewing equipment. Andre Viljoen comments: We are in the process of deciding who needs what, but hopefully that equipment will be put to good use some time soon. I have to say, that is a venue I miss already. Had a couple of pints of their depleting stocks of Weiss today and was re-inspired! Prost! Wolfgang. Every brewery has some kind of idea behind what to do and achieve. Andre Viljoen describe the idea behind Woodstock Brewery with the movie title “Field of Dreams”. We wanted to build something that could be used as a base to aspiring micro brewers giving access to a master brewer and an infrastructure to support purchase of ingredients, help in distribution and help in admin (these are the things that romantics don’t think about). Passion first, but it needs to make economical sense. Last time I wrote that the danish brewer Christian Skovdal Andersen (Bierwerk) was involved. Since the project has been delayed I know Christian has been busy with his brew project BeerHere. Recently he started a project together with the danish brewery Flying Couch Brewing. I hope to see Christian in Cape Town in the future. Talented brewers are always welcome! I suggest they also give Wolfgang Ködel (former brewmaster at Paulaner in Cape Town) a call. Wolfgang is a really talented brewer and if he does not have a new project/involvement he would be prefect for Woodstock Brewery. Literally five minutes’ walk from my house. Excellent news. Any estimate of when it’s going to open? How can I reach Wolfgang Ködel for a brewing related question? Hi is at a wine farm next to Fairview Wine Estate in Paarl. It is called the Spice Route. Yes it is! According to Andre Viljoen they are continuing the renovation of the premises. They are getting closer to discussing styles and what they want to do. can anyone supply me with Andre viljoens number?